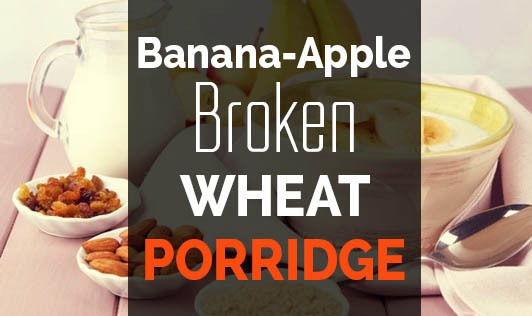 Banana-apple broken wheat porridge is the best way to start the morning. This porridge is full of flavors and brimming with nutrients like calcium, protein, and fiber and the broken wheat helps you stay full for longer periods. Add butter into a pressure cooker and add broken wheat and sauté on low flame for a minute. Add the oats and sauté for another 2 minutes. Add milk and 1 cup water and pressure cook for 2 whistles. Allow the steam to escape. Open the lid, add sugar and cinnamon powder, and mix well. Let it cool slightly and then refrigerate for at least 1 hour. Just before serving add the fruits and mix well. Sautéing the broken wheat and oats in butter before adding the milk removes the raw smell of the broken wheat (dalia). Cinnamon powder enhances the flavor and aroma of the porridge.